James Hildreth is among several Hildreths listed at the bottom of the left-hand page of the image above. the sd town for the year ensuing and to pay the County tax. * Name: James Hildreth Jr.
Massachusetts, Town and Vital Records, 1620-1988, digital images, Ancestry.com (http://www.ancestry.com : accessed 10 January 2018), Westford > Town Records, page 45 (image 34 of 778), James Hildreth Jr. tax assessment. This is an annual tax assessment by the town of Westford, Middlesex County, Massachusetts. I think that James Hildreth Jr. is the one who is my 6th great-grandfather (James Hildreth (1698-1761 who married Dorothy Prescott in 1721). There is another James Hildreth on the line above Jr. There were several other James Hildreths in the town of Westford in this time period, and it is likely that my James is one or the other, presumably Jr. is younger than the non-junior one. If mine is the other one, the total tax is 01 - 04 - 01 - not very different. My James Hildreth has brothers named Ephraim, Joseph, Ebenezer and David, all sons of Ephraim Hildreth (1654-1731) and Anna Moore (1666-1760). The town of Westford was split off from the town of Chelmsford, Massachusetts in 1729, so this is one of the first tax records for the town. 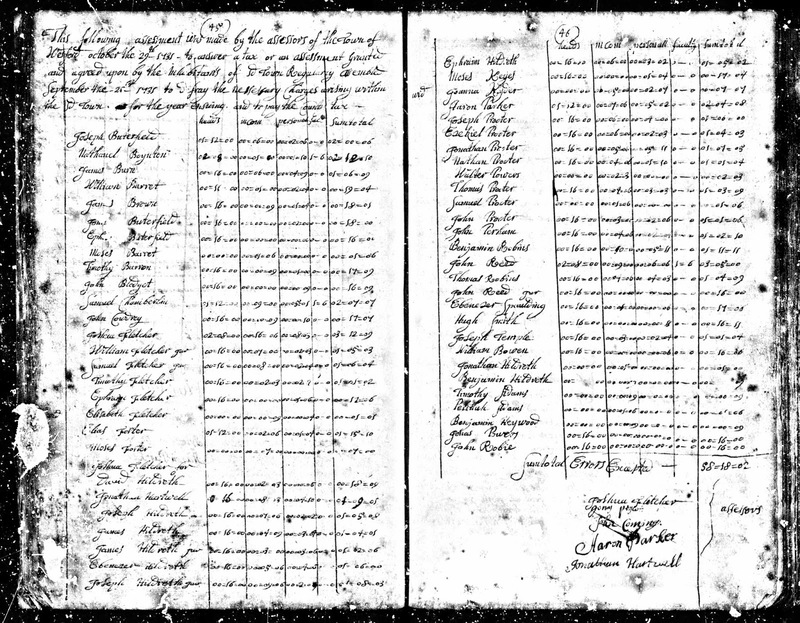 There are other Westford town tax records for other years after 1731. James Hilsdreth (1698-1761) and Dorothy Prescott (1702-1774) are my 6th great-grandparents, through their son Zachariah Hildreth (1728-1784).